In addition to chocolate, cheese is also the most popular food in the world, many foods that can be combined with these cheeses like hamburgers and pizza. On this occasion we will discuss about the benefits of cheese for health. Before we discuss the benefits of cheese we should first know what cheese is? What are the nutritional content of cheese? Cheese is one of the foods produced from the process of coagulation of milk, by separating the solids that exist in the milk content through the process of thickening, it will get a solid form of milk that we usually call the cheese. this process of coagulation milk is called milk coagulation. The process of coagulation or coagulation of milk can be done by using enzymes and bacteria, enzymes used are certain types of enzymes, namely rennet. The result of the coagulation process of milk is then dried and will be processed again in several ways to preserve the cheese. In general, the main ingredient of cheese making is cow's milk, from this cow's milk which will produce several types of cheese. Type of cheese can be distinguished by milk type and processing method. Processes that can produce cheese variations include milking, temperature, drying methods, maturation methods and methods used for cheese preservation. In addition to cow's milk that can be used as cheese, there are still some animals that can be taken milk milk and can be used as raw materials cheese making, such as camel milk, goats, sheep, horses and buffalo. The material is usually used to make a type or type of local cheese only. Actually cheese food has existed since the days of ancient Greece and ancient Rome and some say that cheese was first found in the Middle East by a traveler from Arabia. The discovery of cheese by the Arabian traveler is not inadvertent. He traveled in the desert with a horse, at which time he brought milk for lunch. When the traveler was about to take milk to relieve the thirst of the desert heat, he was surprised to find that the milk he was carrying turned into pale white blobs. This happens because the container that he used to accommodate milk made from animal skin (sheep / cow) that turned out to contain rhizetron enzymes. The heat conditions of the desert and the shocks that occurred on the way have changed the combination of milk and rennet into cheese. Since that incident people began to recognize cheese, and used the enzyme rennet contained in the animal's belly to make cheese. Ferdinand Cohn became the first to discover that the process of cheese ripening is determined by the activity of microorganisms, it was discovered in the early 19th century. Along with the progress of knowledge about cheese processing both biologically and chemically, many people started to make and produce their own cheese. Many houses or ranches are made into cheese-making home industries. 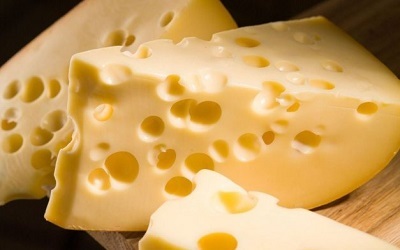 A first cheese factory opened in Switzerland in 1815, but the United States became the largest and most successful producer of cheese for the first time. Until now there are about 400 variants of cheese variants in the world. The nutritional content of cheese is almost the same as all the nutrients in milk. Like fat, calcium, phosphorus, protein, vitamins and minerals, for fat and cholesterol present in the cheese will be harmful to health if consumed in excess. The amount of fat content and cholesterol contained in the cheese is strongly influenced by the ingredients or type of milk used as a cheese making material. Cheese has many health benefits because it is rich in protein, especially for children who need protein in large quantities to help grow flowers. With a soft texture the cheese has a salty and savory taste, cheese is also often combined with other food types such as pizza, hamburger, kebab, etc. Cheese is often regarded as a food that can make our body become fat and overweight, when fact cheese has good benefits for health. Chinese and Dutch researchers conducted a data collection of 200,000 participants to consume cheese regularly with a certain portion every day. The result they found that participants who consume cheese every day have most likely escaped from stroke. Their next data found that 14% of participants who consume cheese regularly can also avoid coronary heart disease. Quoted from klikdokter.com, the risk of coronary heart disease can be reduced by the high content of cholesterol (HDL) in the body. As we know HDL (Hight Density Lipoprotein) plays and functions as an arterial vascular cleanser. While LDL (Low Density Lipoprotein) acts as a carrier of cholesterol in the blood. In the cheese there is also a mushroom penicillium roqueforti which is a fungus resulting from the fermentation process. This fungus is believed to destroy the type of bad bacteria that can convert HDL (Hight Density Lipoprotein) to LDL (Low Density Lipoprotein) and also believed to reduce inflammation. In addition, the substances contained in the cheese is believed to control blood pressure in the body, therefore cheeses become very good for maintaining heart health. Although it has benefits for the health of the body, the amount of intake of cheese that is allowed into our bodies is only about 40 grams a day. This is because cheese also has saturated fat content which if you consume in excess can cause negative effects for health. So just 40 grams only, do not be exaggerated for good reasons or hungry. And make sure also what you eat or that enter into your body it is really cheese, not just cheese flavor. If the original cheese you eat then you can be sure you will get the health benefits of the cheese. For optimal results do not forget to exercise and enough physical activity, this will be very helpful for your heart health.